Turkey hunting can be an enjoyable adventure, especially if you have the right type of gear. A successful turkey hunter uses turkey decoys, the right type of gun, and the best turkey calls on the market. There are several different types of calls that rookie and veteran hunters can use to bring in the big Toms and hens. Along with bringing the birds to you, turkey calls are quite fun to use. It is helpful to know the different types of turkey calls that are available on the market today. One of the easiest calls it the friction call or the pot-and-peg call. These are small hand-held calls that include two pieces that rub together to create a turkey noise. The types of materials will determine the sound and the sound will bring in different turkeys. Some are made of wood, slate, glass, or other options that create noises that turkeys cannot resist. 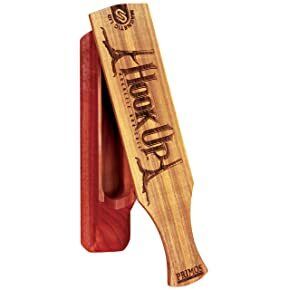 Another type of turkey call is the tube call. 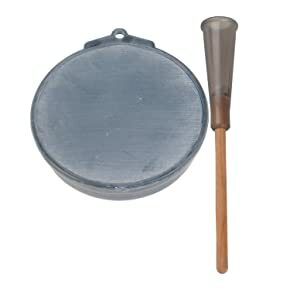 Highly experienced turkey hunters like to use these because they can make their own noises with them. With this variety, turkey hunters can change up the calls mid-hunt to keep the turkeys coming for more. The tube call includes a reed for the bottom lip. The top lip goes on the top of the call. It does take time to get used to, but the practice is worth the rewards. A call that is useful for all hunters is the diaphragm call or mouth. These are easy to use, after a little bit of practice. They are also very affordable. They are hands-free, which is helpful when you are tracking down a gathering of turkeys. They sound like real turkeys, which brings them in – after you have located them. The turkeys will think you are a real turkey and they will come running. These three calls, the friction, diaphragm, and tube, will bring turkeys to you, but it is helpful to know where to start. The locator call does that job. It is a mouth call that does not sound like a turkey. Instead the call will replicate the voices of other birds and the turkeys will reply. Then, you can head towards the gobble and get set up for the calls that will bring the turkeys within shooting range. Locator calls are easy to use. You simply wrap your mouth around the proper end and blow out. Before you venture out on a hunt, it is a good idea to practice the calls several times. You should only use the calls that are comfortable for you. If you use a call that you have never used, you might walk out of the woods with nothing to show for your time. Fortunately, there are plenty of videos available to help you understand how to use the different types of calls. Prior to buying your first or tenth turkey call, it is helpful to know what to look for in the different calls. There are so many calls on the market that it can get overwhelming. Therefore, it is a good idea to look at the type of sounds the call makes. This involves understanding pitch and rasp. Pitch is the range of high and low tones. Turkeys can have different pitches, just like people can. So, as you shop for your newest turkey call, try to find one that has a range of tones from high, mid, and low. When you are out in the woods, the turkey’s response will you know what tone is the best choice. If you have a variety of tones at your fingertips, you will have more success when hunting. Turkeys can have a raspiness to their voices. As turkeys get older, it is commonplace for their voices to develop a rasp and the lower the pitch, the easier it is to recognize the rasp. This sound will attract Toms who are looking for hens. Like pitch, it is helpful to have calls that have different ranges of rasp so you can choose one that fits the sounds of the raspy turkeys you hear. It is also a good idea to find a turkey call that is easy for you to use. It is not worth it to use a call that you cannot get to perform. Since you have to be patient with your turkey hunting, but struggling with a call will force you to wait longer than you should. It doesn’t matter how much money you spend on the call, if you cannot get the call to work, then it is worthless for you. As you shop for your newest turkey call, remember that hunters usually have several calls that they take with them into the woods. There is nothing wrong with loading your vest with calls because you just never know which one will work on the turkeys that are roaming in your area. Pairing the right turkey call with a great turkey decoy will help you get your fill of the wild game bird. 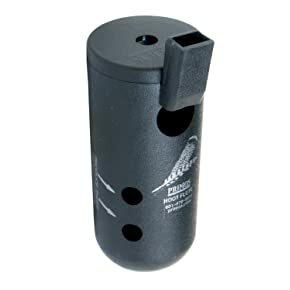 This box call has been a popular option for many years and after using it, you will quickly see why. It is made of high-quality materials so you can use it for a long time. It has a magnetic hinge so you can get the box to cut, purr, and yelp. The rare-earth magnet holds the paddle where it needs to be and it has a removable pad that you can use to carry it quietly as you look for your own turkeys to shoot. 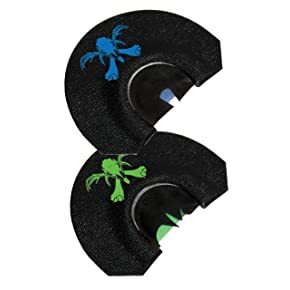 This turkey call is affordable and easy to use. It does require the use of chalk to get the call to make the right noise. It does not matter if you are left or right handed, the call can be used by anyone who is out to get a turkey or two. The slate call is proudly made of slate taken from Pennsylvania. The slate call lets you create several sounds like little yelps, longer purrs, and quick clucks. The call includes a striker made of hardwood. There is also a conditioning pad included. The call is simple, but highly durable – so it will withstand the abuse of being used out in the field. This call is easy to use and extremely affordable. Primos is known for its quality products at affordable prices and this little call proves it. Like all calls, it is wise to practice using it and striking it in different ways so you know how to get it to make different sounds. A push-button call is a small call that is completely contained. It has a post that slides over material that makes the attractive sound. This can be used with one hand, by pushing and pulling the post back and forth. You can move the post with different tensions so you can vary the volume and quality of the call. It also includes a silencer so you can keep the call from making noise when you most around through the woods. This little call can also be attached to a gun so it can be completely hands-free – you can keep your hands on your gun. It is important to keep the call dry – or it won’t work at all. It also requires chalk to keep the friction working. There are several calls that are much less expensive than this call. This little set includes two calls to help you build your collection. There are two different calls in this package: the Hook Hunter with Ghost Cut and the Hook Hunter with Spike Cut. The Ghost Cut makes purrs and kee-kee sounds and the Spike Cut is a universal turkey call device. The pair are known for providing sounds that are realistic so Toms and hens cannot stay away. The reeds are precisely cut so the sounds are similar from call to call. The lightweight calls are easy to take to the field. Just throw them in your vest pocket and make your way out to the woods. It does take time to practice and learn the techniques, but as a beginner it is good to know that this is one of the easiest calls to learn to use. There are plenty of videos available to learn to use the diaphragm call. A gobbler shaker call is a loud call that is one of the easiest to use. You simply shake up the caller and it makes a gobbling sound. It offers the variety of Jake and Tom calls. With one hand, you make the Jake sound. With two hands, you make the Tom call. 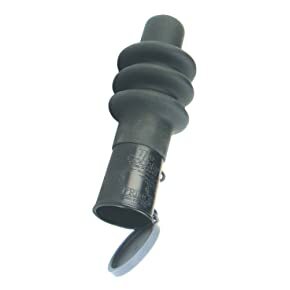 This call does have a silencer for the times that you do not need any noises made. The turkey call is loud and does help locate turkeys and it challenges them into making contact. It is an easy choice for children and rookie hunters to use. Gobblers do come running because they want to know what is making the realistic noise in their area. It is a quality-made product, so you will be able to use it for several years. It is a nice addition to a collection; use it with other calls to make conversation. A good locator call will let you know where the turkeys are. This call does not replicate the sound of turkeys, but of other birds. You choose the sound you want to make based on the birds in the area and the turkeys will respond. This call is designed to replicate the sounds of owls and it will get owls to respond, as well turkeys. The Hoot Flute is loud, but notes are high pitched. It can be fun to use even if you do not enjoy turkey hunting – you will surprised how many owls are nesting around your area. Turkey calls are an easy object to add to your hunting collection. It is a good idea to add more than one, because different situations benefit from different types of calls. Most calls do take practice to master, but it is worthwhile to practice and get the techniques down pat. High quality turkey calls with accurate sounds result in more successful turkey hunting expeditions. The goal is to exit the woods with a turkey or two, and a good call will make that happen. Best Slate Turkey Call is probably the best choice among the products that you’ve mentioned since it can produce different kinds of sounds. Turkey hunters will need different kinds of sounds depending on the season that they are currently hunting on. 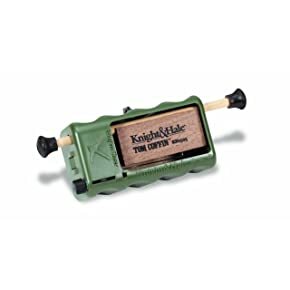 Like if they need to call a tom or a hen, they will need a specific sound that will attract them using the turkey call.